Создание новых схем, технологий, и характеризационных методик для квантовых каскадных лазеров среднего ИК диапазона (λ ~ 3-15 µm). J.P.Commin, D. G. Revin, S. Y. Zhang, A. 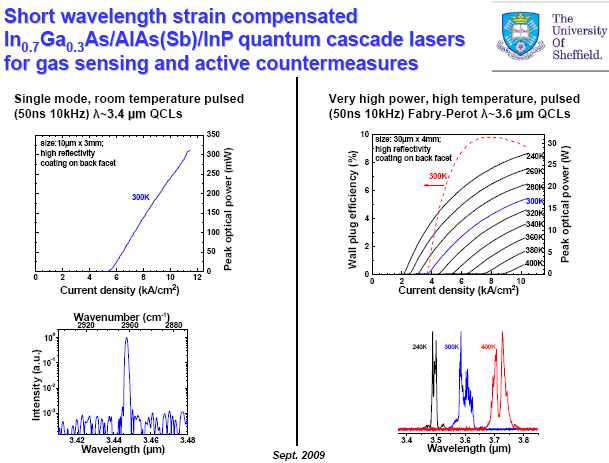 B. Krysa, J. W. Cockburn «High performance, high temperature λ ~3.7 µm InGaAs/AlAs(Sb) quantum cascade lasers” Appl. Phys. Lett. 95, 111113 (2009). D.G.Revin, M. R. Soulby, J. W. Cockburn, Q. Yang, C. Manz, J. Wagner «Dispersive gain and loss in midinfrared quantum cascade laser” Appl. Phys. Lett. 92, 081110 (2008). D.G.Revin, J. W. Cockburn, S. Menzel, Q. Yang, C. Manz, J. Wagner «Waveguide optical losses in InGaAs/AlAsSb quantum cascade laser” Journal of Appl. Phys., 103, 043106 (2008). R.Nelander, A. Wacker, M. F. Pereira, Jr, D. G. Revin, M. R. Soulby, L. R. Wilson, J. W. Cockburn, A. B. Krysa, J. S. Roberts, R. J. Airey, «Fingerprints of spatial charge transfer in quantum cascade lasers” Journal of Appl. Phys. 102, 113104 (2007). D.G.Revin, J. W. Cockburn, M. J. Steer, R. J. Airey, M. Hopkinson, A. B. Krysa, L. R. Wilson, S. Menzel, «Improve performance of In0.6Ga0.4As/AlAs0.67Sb0.33/InP quantum cascade lasers by introduction of AlAs barriers in the laser active regions” Appl. Phys. Lett. 91 051123 (2007). D.G.Revin, J. W. Cockburn, M. J. Steer, R. J. Airey, M. Hopkinson, A. B. Krysa, L. R. Wilson, S. Menzel, «InGaAs/AlAsSb/InP strain compensated quantum cascade lasers” Appl. Phys. Lett. 90, 151105 (2007). D.G.Revin, J. W. Cockburn, M. J. Steer, R. J. Airey, M. Hopkinson, A. B. Krysa, L. R. Wilson, and S. Menzel, «InGaAs/AlAsSb/InP quantum cascade lasers operating at wavelengths close to 3 µm”, Appl. Phys. Lett. 90, 021108 (2007). D.G.Revin, L. R. Wilson, J. W. Cockburn, A. B. Krysa, J. S. Roberts, and R. J. Airey «Intersubband spectroscopy of quantum cascade lasers under operating conditions”, Appl. Phys. Lett. 88, 131105 (2006). D.G.Revin, L. R. Wilson, E. A. Zibik, R. P. Green, J. W. Cockburn, M. J. Steer, R. J. Airey, M. Hopkinson «InGaAs/AlAsSb quantum cascade lasers” Appl. Phys. Lett. 85, 3992, (2004). D.G.Revin, L. R. Wilson, E. A. Zibik, R. P. Green, J. W. Cockburn, M. J. Steer, R. J. Airey, M. Hopkinson «λ ~ 4 — 5.3 µm intersubband emission from InGaAs-AlAsSb quantum cascade structures” Appl. Phys. Lett. 84, 1447 (2004). R.P.Green, A. Krysa, J. S. Roberts, D. G. Revin, L. R. Wilson, E. A. Zibik, W. H. Ng, J. W. Cockburn «Room-temperature operation of InGaAs/AlInAs quantum cascade lasers grown by metalorganic vapor phase epitaxy” Appl. Phys. Lett. 83, 1921 (2003).